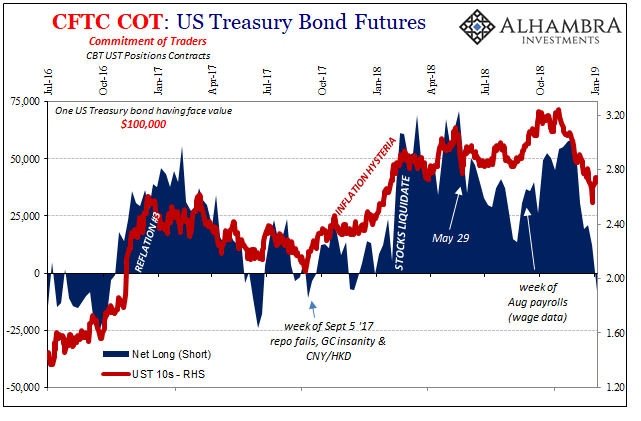 On Friday, the CFTC posted its COT data for the first week in 2019. For crude oil, capitulation. 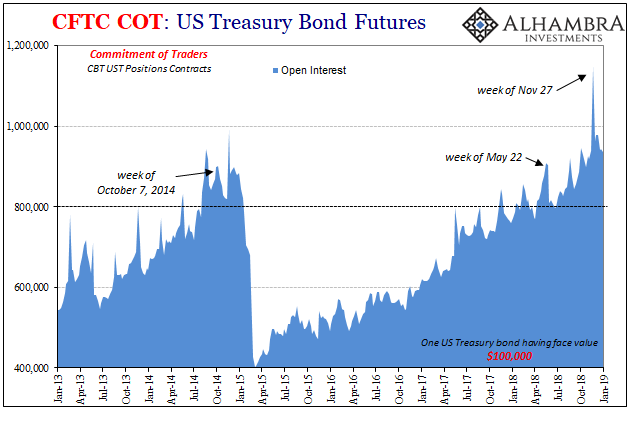 For US Treasury bond futures, capitulation. In the latter financial market, unsurprisingly the net market position utterly collapsed during December. From a relatively high (meaning market overall short) +58k contracts that last week in November when everyone piled into liquidity hedges, the updated estimate for the week of January 8 is -8k. The last time we saw one of this magnitude in UST futures was in the first few months of 2014. 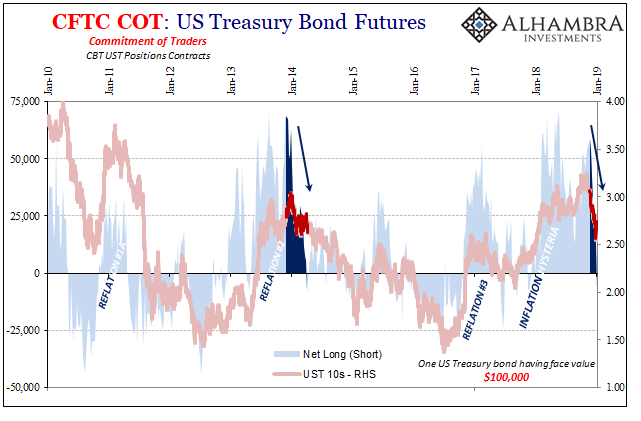 From late December 2013 to early April 2014, the net position went from +69k to -8k; from short UST futures because interest rates have nowhere to go but up to slightly long them as liquidity hedging returned and the dollar started to do funky things. From fairy tale to prudence. What’s unusual this time is just how quickly everything changed. In 2013-14 during the transition out of Reflation #2 and into Euro$ #3, the collapse in the market short took 17 weeks. Now as Euro$ #4 moves in, only 7 weeks. It takes something big to flip the UST curve into inversion. 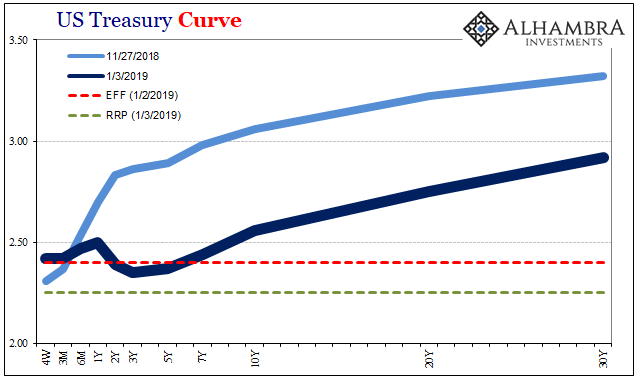 December 2018 and what went on absolutely qualifies – because the UST curve inverted as futures market participants capitulated. It was a paradigm change from dominant inflation expectations (thus, the market being short overall) to the more familiar deflationary sequence that starts with prominent outbreaks of liquidity hedging. 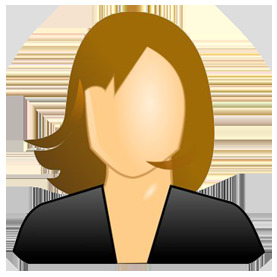 Inflation, therefore, accelerated growth had been rationalized repeatedly since the middle of 2017. The unemployment rate was just one factor supposedly pushing for it. Somewhat related, many proposed “money velocity” as another sea change in the global economy’s direction.